Abu Ali Mustafa was a Palestinian leader who lived and died defending the Palestinian cause and the rights of the Palestinian people. Ten years ago today (August 27, 2001), a U.S-made Israeli army Apache helicopter fired two missiles into his office, blowing him to pieces. This was one of many targeted assassinations of Palestinian leaders, one component of Israel’s brutal and consistent policy of ethnic cleansing being carried out against the Palestinian people. Abu Ali Mustafa (Mustafa El-Zabri) was born in the village of Arrabeh, near Jenin, in 1938. At the age of 17, he joined the Arab National Movement in Jordan, where he confronted the Jordanian government’s cooperation with the British colonizers. Two years later, in 1957, political parties were banned in Jordan and Abu Ali Mustafa was arrested and sentenced by a military court to five years in an East Jordan prison. After being released in 1961, Abu Ali Mustafa continued his political work with the Arab National Movement and became responsible for the Northern District of the West Bank. After the 1967 War, Abu Ali Mustafa joined Dr. George Habash in forming the Popular Front for the Liberation of Palestine. He led the first commandos through the Jordan River inside Palestine and started forming the underground body of the PFLP. The Israelis searched in vain for him while he operated in the West Bank. After several months, he secretly returned to Jordan. 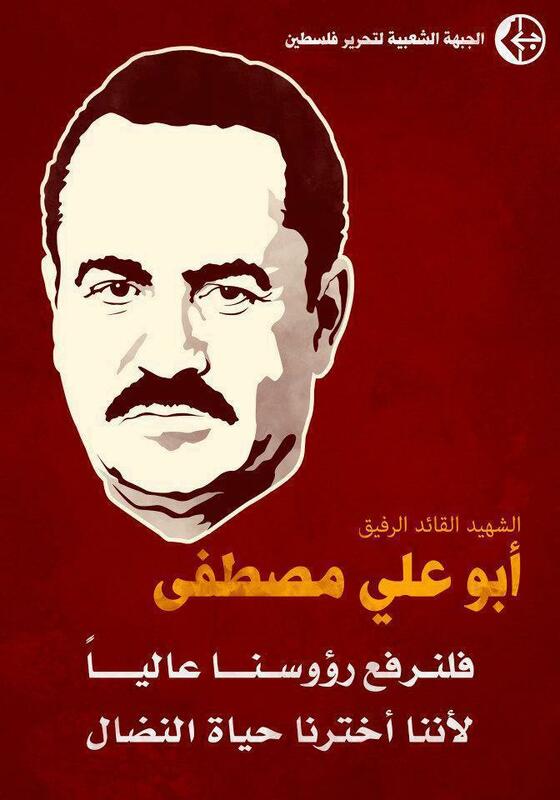 In addition to being responsible for the PFLP in the West Bank, Abu Ali became the commander-in-chief of the PFLP military forces (including the battles of Black September). The PFLP engaged in violent resistance to bring the Palestinian plight to the world’s attention, and succeeded in doing so. One of the PFLP’s biggest operations was the concurrent hijacking of 4 aircraft and blowing them up (after releasing the passengers). After the confrontation with the Jordanian army in the battles of Black September (1970), Abu Ali relocated to direct operations from Lebanon. In 1972, at the Third National Conference of the PFLP, Abu Ali was elected as a deputy to the Secretary-General, Dr. Habash. In 1982, following the Israeli invasion of Lebanon, Abu Ali and other PFLP members moved to Syria. While residing there, he resisted Syria’s attempts to control the PFLP, resulting in a temporary relocation to Iraq in the late 70’s. From 1987 until 1991, he was also a member of the PLO’s Executive Committee. In 1999, the Palestinian Authority arranged permission for Abu Ali to return to Palestine, with the promise to Israel of curbing the PFLP’s activities. At the PFLP Sixth National Conference in July 2000, Abu Ali was elected Secretary-General. Abu Ali advocated for a one state solution, where Palestinians and Jews all had equal rights. He was against the Oslo agreements, and was a strong defender of the Palestinian right to return.